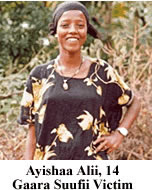 Ayishaa Alii (see picture above) was a fourteen years old, barely a teenager. According to her mother, Aadde Shamsii Ahmed Muusaa of Mi’eessoo, a divorced mother of six, Ayishaa attended school in Asaboot up to grade four. She was forced to discontinue her schooling to help her mother raise her younger brothers. Aadde Shamsii described the events leading up to her daughter’s murder to VOA as follows. As you can see or hear, their stories are consistent and shows that impunity for human rights abuses remains the norm in Ethiopia. “Nama iyyeef ollaan dirmata” jedha Oromoon. Do international human rights advoctaes know about this massacre? Does the world know? Have we done our part to bring the plight of our compatriots to the attention of the world public? Lest we forget Gaara Suufii! Please forward the English version of the clips to as many human rights advoctaes as you can.